Ansonia Clock Co., "Dispatch", ca 1883. Ebony case is 30 inches high. It has been repainted which means the silver had to be put back in the etchings. The tail has been broken and repaired. It was a clean break, so it is hardly noticeable after it was glued back on.The movement is 8 day, striking a gong, running very well. The pendulum is correct. 8 inch paper dial has been replaced. 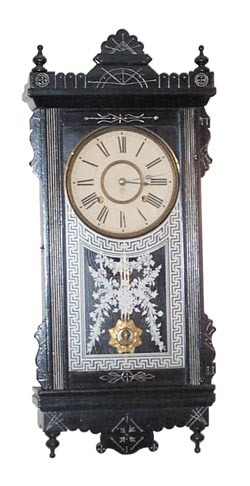 The pendulum and glass are identical to the clock pictured in Ly-Ansonia No.573.